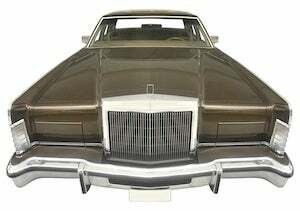 AMC has two good shows and Lincoln has two good cars. Makes sense to tab a "Mad Men" star to push tin quickly. But will it work? Is it OK to have a belt of scotch before breakfast? According to reports from several news outlets, including Bloomberg, Ford chief Alan Mulally told reporters, passersby and anyone listening that Lincoln would be on the business end of Ford's first efforts to right their ship. In fact, the long-term business plan includes selling Lincoln overseas (read: China) in about five years. How you like that? Give Ford some credit. Even though the Lincoln lineup is somewhat forgettable outside of the MKX and the Town Car, at least they're trying to make things work with Lincoln, something they certainly didn't try with Mercury. I have at least three ex-girlfriends who didn't even give me that courtesy. So how's this Lincoln reboot supposed to work? Well, Ford's first lesson for its luxury offspring: Spare the rod, bring out the bat. Earlier last month Ford told Lincoln dealers to clean up their act - and their places - and reportedly told them to shell out $500,000 to $2 million per showroom to get the windows washed and make the place a little nicer. It could be tough love as, according to reports, Lincoln has five times more showrooms as Lexus, who by the way, sells three times more cars than Lincoln does. Roughly translated the move is designed to ding the lower-end Lincoln Ford dealers, and leave only fat-backed, metro-area dealers with a lot of inventory left ready for Lincoln's revival. So what's a new-look Lincoln supposed to look like? Will it be a glorified version of Ford? Or will it be something different? Maybe one word, three syllables: Ca-dil-lac. To ensure Lincoln's profitability, Ford would be wise to make Lincoln look a lot less geezery and more like America's avant garde brand. Pull a Lamborghini, Lincoln. Here's the rub: Lincoln so far has only announced a smaller car on the horizon, and the usual Ford do-overs to keep the luxury automaker alive. And current sales prove that's just not going to be good enough. Style won't save Lincoln alone. Ford's lone upscale brand - with Aston, Rover and Volvo gone now - is going to need more. Either you have looks and speed, affordability or nothing at all. Lincoln's going to need a two-door speed machine or an all-out performance sedan to compete in with BMW's 5-series, Benz's C-class, Cadillac's CTS, et al. Perhaps both would be a good idea to build. Coupled with the EcoBoost engine, Lincoln could only be two models short of a new brand identity. Here's the good news: Lincoln's got a winner in the crossover MKX and the Town Car will likely be the sales leader for limos for drunk girls to throw up in for a long time. So there's nothing left to fix there. Ford's interest in boosting Lincoln back to rarified air is crucial to long-term success for Ford. Whereas the Fiestas and F-150s of the world are giving Ford a better name nowadays, it's the MKXs of the world that better line the pockets of Ford execs. There's a lot of margin in those luxury cars. After Ford is done pummeling dealers with diamond-studded bats, the new-look Lincoln could leave other luxury brands behind by being America's automaker with "danger" for a middle name. They don't have to strap lasers on the cars, but something beyond the norm would be a good start. Is all this possible? Yes. Will it happen? Probably not. Edmunds reports that Lincoln spent nearly $5,000 per car in incentives in August to entice sales, and despite deep discounts and incentives, sales are only up a few percentage points when the rest of the industry is counting gains in the double digits. Slumping sales mean addition by subtraction and the five-year plan could include more cost-efficient Ford cars rather that bold new designs. Ford is going the right way by hiring Lincoln-only designers and engineers but without serious cash infusion, the five-year plan will look a lot like the last-five-year plan. So what are we back to? Lining up popular TV stars to sell more cars? It would seem so. Maybe Ford can go back to selling De Tomaso off the lots. The Pantera could look good again.